I think I was pondering pumpkin recipes back in August. That's when the pumpkin bug hit me. To Read More, Click On The Recipe Title. I have lots of recipes using pumpkin that are all delicious and old stand bys that will definitely be made during the fall and winter. It's always exciting for me to find a new recipe to blog about, well new to me, and share it with you. I found this recipe on Food.com. It was first posted in 2002. I can't believe I didn't know about this till now. 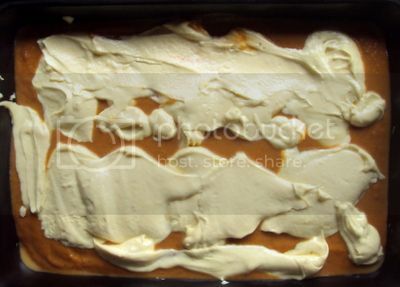 This pumpkin cake has 3 layers, the cake batter, the pumpkin pie batter and the topping. Its a little more time consuming than an average coffee cake but well worth the effort to make. This coffee cake is an explosion of textures and warm spices that your mouth will thoroughly enjoy. 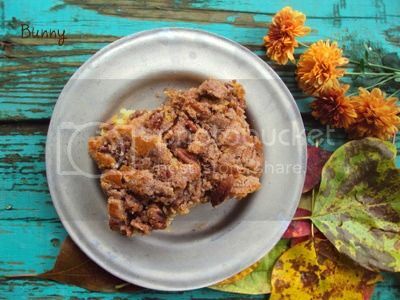 In your first bite you get the moist cake that envelopes a smooth creamy pumpkin pie filling with all those warm spices we love, then the crunchy pecan topping comes in and your mouth startes to chew and savor all those wonderful flavors all at once. Lets talk about the layers. The cake batter is pretty much a basic homemade yellow cake. The recipe said to combine the first 8 ingredients to make the cake batter. Which gives me a vision of someone dumping all the ingredients into a bowl and mixing. I didn't do that. I treated this like I would any other homemade cake and combined the dry ingredients and sifted them together. Then I creamed the butter and sugar, added the eggs , then the vanilla. I started adding the flour and sour cream alternatly in batches. Flour first, mixing till just incorporated then adding half the sour cream, mixing just till incorporated, then another batch of flour, the last half of the sour cream which was followed by the last batch of flour. Always mixing till just incorporated . 3 batches of flour, 2 batches of sour cream. This gave me a gorgeous cake batter. The recipe said to mix the last 8 ingredients together, which literally amounts to a pumpkin pie batter with only half a cup of evaporated milk. 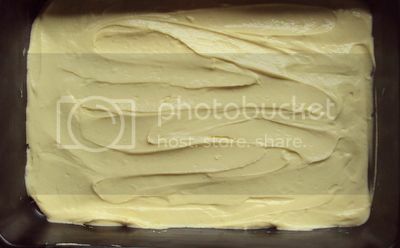 Think about what you could do with this batter.....It could be a layer in cupcakes, keeping in mind it needs to be baked and not piped in to cupcakes, it could be a layer in a quick bread, you could use this in another cake as a layer. OHHHHH the possibilities! 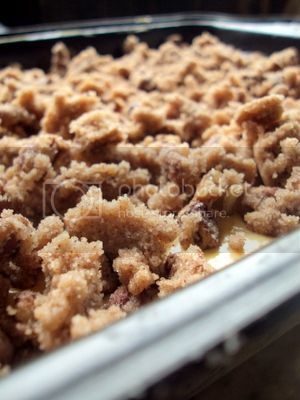 The topping was pretty basic and once again could be used on another coffee cake , muffins, or quick bread as an alternative to crumb topping. Once again , my kitchen lighting isn't all that great so I picked the best of the pictures I took to show you the layers as you put them together. Take half your cake batter and spread it into the bottom of a greased 13x9 inch pan. Your gonna have to eyeball this. I didn't get exactly half the batter down first, my filling wasn't centered perfectly in the middle of the cake, but that was ok wth me. It was in there, good enough for me. Spread your pumpkin layer ontop of the cake batter, pretty easy so far. 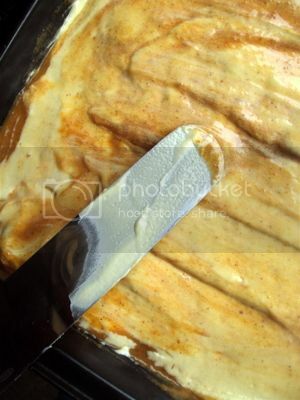 Using a frosting spatual or a large spoon, scoop up some of the remaining cake batter and as you let the batter fall , move your hand across the cake so the the batter doesn't fall in one big blob. It's not going to be perfect, it doesn't have to be perfect. Take your spatual or spoon and start smoothing the batter out to cover the cake. Yes some of the pumpkin will be on the top, but it's all good. The topping is going to be pretty much a mixed mass of butter, sugar and pecans. Take portions of the topping in your hands and let your fingers push pieces of it onto the cake, filling in any empty spaces. Bake at 325 degrees for 50 to 60 minutes. If your using a dark colored pan, you may want to check on the cake 45 minutes into baking to check for doneness. Try to let the cake cool completely before devouring, all the flavors are at they're best when the cake is completely cooled. I hope you enjoy this cake as much as we did, it's a new family favorite. God Bless you and yours. 1 Grease or spray the bottom of a 9x13 pan. 2 Mix together first 8 ingredients. 3 Pour 1/2 of the mixture in the 9x13 pan. 4 Prepare the pumpkin exactly like the pumpkin pie recipe on the can of pumpkin except you only use 1/2 cup of evaporated milk Or just mix together the next 8 ingredients. 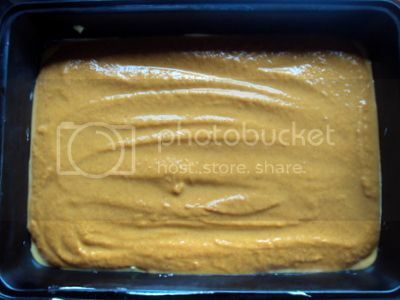 5 Pour all of the pumpkin mixture over the batter in the 9x13 pan. 6 Pour the remaining half of batter over the pumpkin (this step is a little difficult-it's ok that the pumpkin mixes in a little with the batter) Make the topping, put over batter. 7 Bake in a 325 degree over for 50-60 minutes. Oooohhh, that looks fabulous!! I can't WAIT to try it!! Lovely post. Great fotos and recepie! Bunny, this looks completely amazing. Exactly the kind of thing I cannot (repeat--cannot!) resist. I think I may just have to PIN this baby! That looks delicious!! Can't wait to make this, I'll have to send you my recipe for Coffee Cake. Check out my latest episode of JT's Artist Oven!.